I am a ConfigMgr consultant by heart where I have spent most of my IT-career designing and building ConfigMgr Solutions for customers. 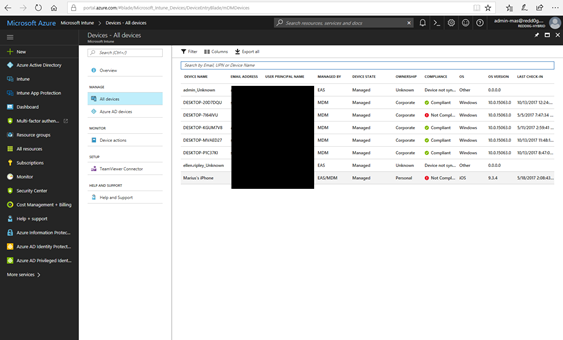 And everyone that has worked with ConfigMgr knows that you can report on basically anything from the clients managed by ConfigMgr. 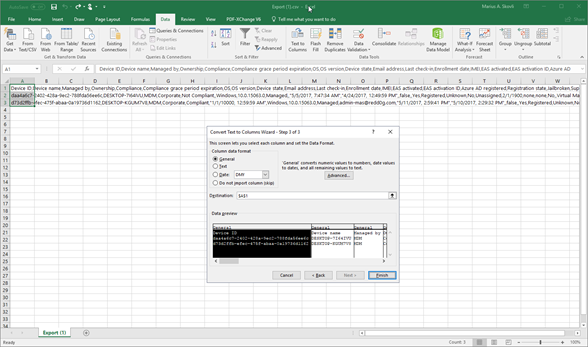 If you don’t see the data, the reason is probable that the the Agent is not configured to harvest it. 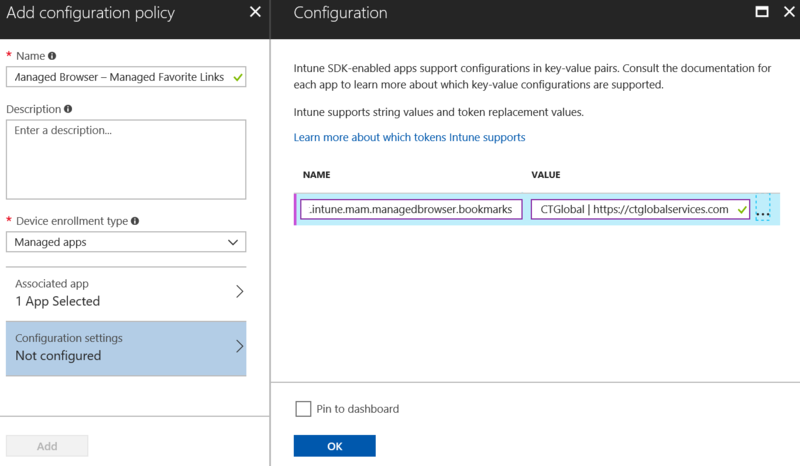 Well for the past 3-4 years I have also been working with Intune where the reporting capabilities has been a bit limited, especially devices managed through mdm, however the reporting has capabilities been greatly improved over the last couple of years. 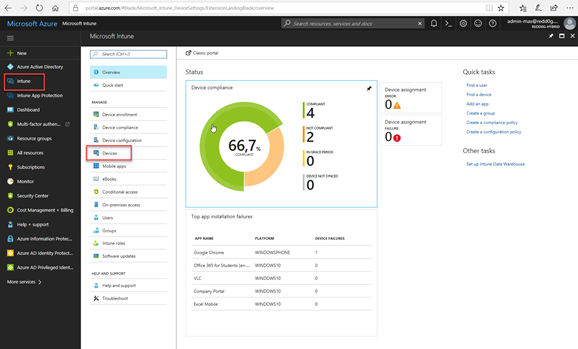 And I was thinking of doing a two-parted blog post to quickly show what you can do in the Azure Intune Console, and when you need something more advanced like PowerBi. Let’s take take a look at what you can do with the basics. 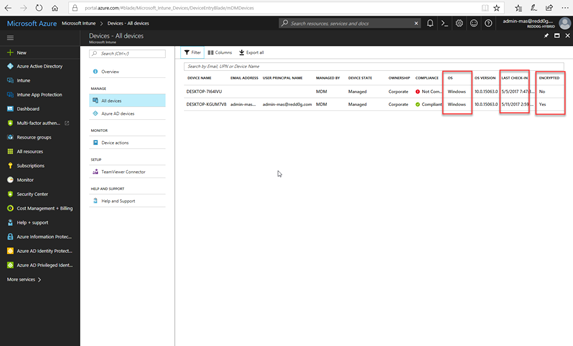 Start by logging on to the new Azure portal https://portal.azure.com (we will not use the old portal). 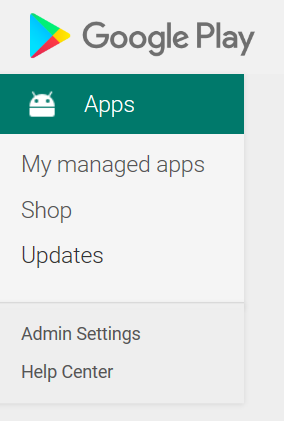 Then when you have logged in to the portal go to the Intune Blade and then click on devices. 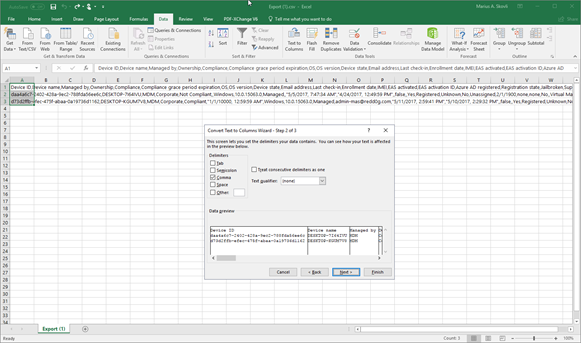 It is in this view where you have the possibility to create some “basic reports”. 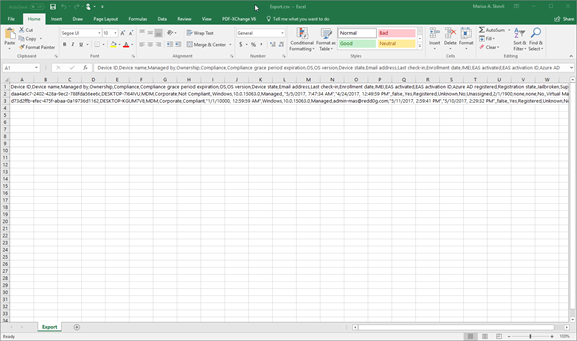 Here is an example where I have filtered on my Windows Devices that has not checked-in with Intune in over 1 month and I have added the column Encryption to see if the devices is Encrypted. 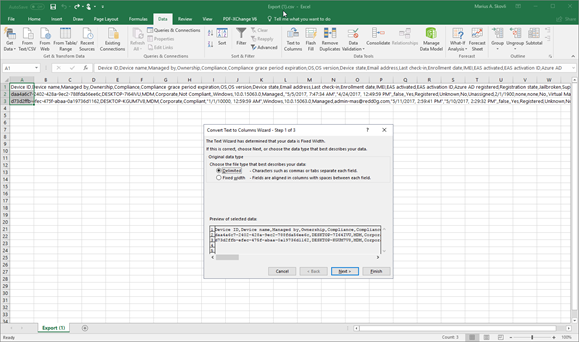 Then when you export the data you will download a CSV-file in which you can open with Excel for further configuration and adjustments. Choose Delimited and click next. 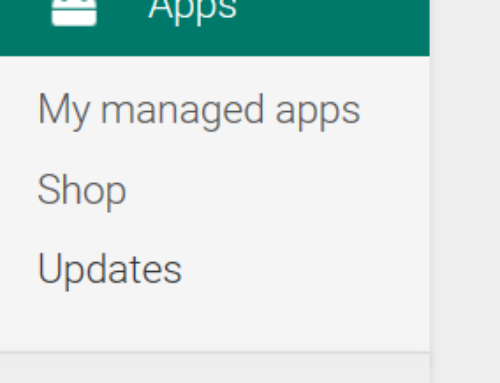 Choose comma and click next. On the last screen click finish. 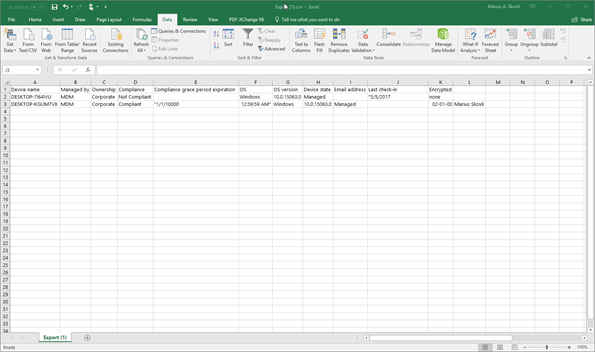 Now, it’s done and you have organized your columns and tables. 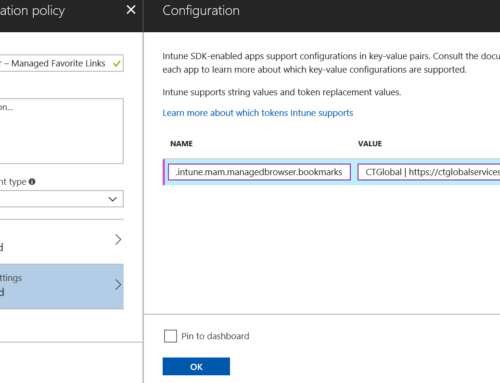 This was a quick look at the basic capabilities in Intune. 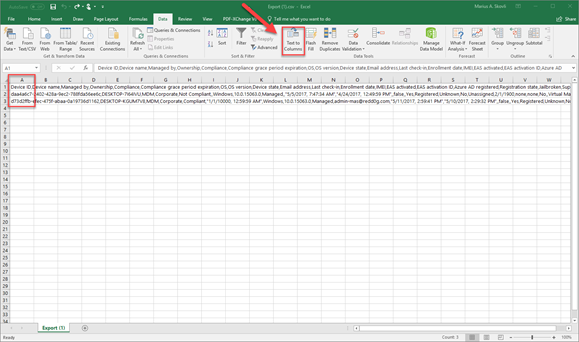 Now, you have more advanced options with Intune Data Warehouse and PowerBi which we will look at in Part 2.
thank you for the article Marius, any idea why my Security Patch Level column is empty and the Device Threat Level column shows Unknown. I mean those are like the two most useful pieces of information I wanted to see, the rest is trivial.